A flash flood on the Spanish island of Majorca has killed at least 10 people, including at least three foreigners. A wave of muddy water engulfed the town of Sant Llorenç des Cardassar, in the east of the island, after heavy rain caused a river to burst its banks. Vehicles were swept away as water gushed through narrow streets. Hundreds of emergency workers and sniffer dogs are involved in the search-and-rescue effort. A five-year-old child is missing. The dead include six Spanish nationals, a Dutch tourist, a British couple and one unidentified victim. 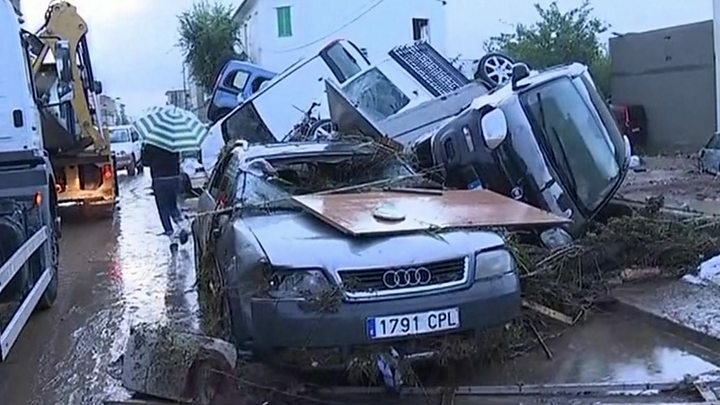 Worst affected was the town of Sant Llorenç des Cardassar, where cars were swept away. The British couple was travelling in a taxi there when it was caught in the flood. The driver was among the victims. A woman who had been in her car with her two young children also died. As the waters rose, she managed to get her eight-year-old daughter to safety, but she was unable to save her son aged five, who is still missing. One survivor told the local Diario de Mallorca website that he had had to climb out of his car window to get to safety. "I swam 500m [1,650 ft] through the torrent until I got to a house," said Manuel Torrescusa. Three other victims died in the coastal town of S'illot. The UK's Foreign Office said it was "urgently seeking updates" from Spanish authorities following news of the British couple. The area was hit with more than 8in (20cm) of rainfall in just a few hours on Tuesday, according to Spanish meteorological agency Aemet. A senior official from the Sant Llorenç mayor's office described the situation as a "disaster". One Aemet official said such intense conditions of torrential and localised rain occurred only every 80 years. A bridge came down further north on the island in Artà, where an ex-mayor of the town was killed by the flooding. What efforts are being made to help people? Refuges were set up in a local sports centre to provide shelter for displaced residents. Prime Minister Pedro Sanchez visited the area on Wednesday, and the Spanish parliament in Madrid held a minute's silence. Torrential rain hit other areas of Spain too, with Catalonia in the north-east and Málaga in the south among the areas badly hit.